A Literary Odyssey: Blogversary Giveaway #2. This week is my two-year blogversary here at A Literary Odyssey, so I am taking the opportunity to pass along some wonderful reads to my readers. Now, while I am currently only focusing on the classics, I have soft spots for a lot of different things. Growing up, I loved a lot of the traditional children's books. As a teen, I explored science-fiction and fantasy, as well as Young Adult novels. A lot of those titles have stuck with me, even through this process of reading Dickens and Faulkner. I want to share two books with this giveaway's winner that I absolutely adore. 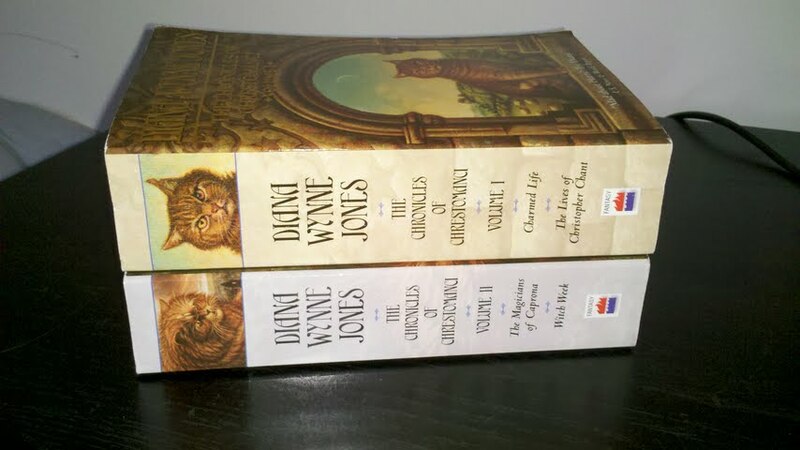 Earlier this year, the author of these, Diana Wynne Jones, passed away. And I think that someone else out there needs to discover the amazing worlds she has created. 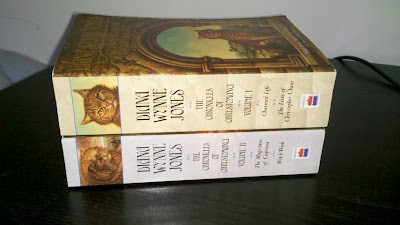 Pictured above are volumes 1 and 2 of the Chrestomanci Chronicles. Each volume contains two smaller novels, so really, you're getting four books here. :) They are fun, inventive, and highly addicting. And I sincerely hope that you'll love them as much as I do. The giveaway ENDS Wednesday, August 31st at 11:59 EST. In your comment/entry below, answer the following question: What was your favorite book or series as a child? Why? Mike Mulligan and His Steam Shovel by Virginia Lee Burton. I remember loving the illustrations and I wish I knew where my copy went. How kind of you to share these! When I was young, I loved Louise Fitzhugh's Harriet the Spy and its sequel, The Long Secret; and later, the third volume, Sport. I had several other favorites: Chronicles of Narnia, the Laura Ingalls series, and The All-of-a-Kind Family. My first DWJ was Dogsbody, but it wasn't until years later that I found more of her books -- my library only had one and we didn't have ILL or an online catalog since this was back in the Dark Ages before computers! When I was very, very little, I read through Bruce Coville's Unicorn Chronicles. Well, back then there was only two. But they were thick and impressive to me back then, and I was so proud to have read through them! I was in fifth grade when Harry Potter came out... which quickly became my favorite series. I read my first of Jones' books (Howl's Moving Castle) for the Dewey read-a-thon in April and have been wanting to read more of her work ever since. When I was little I loved the Narnia series, but a few of my other favorites were The Phantom Tollbooth, The Secret Language, The Westing Game, The Mystery of the Cupboard, Midnight in the Dollhouse, The Secret Garden, Bunnicula, Mrs. Frisby and the Rats of NIHM, From the Mixed-up Files of Mrs Basil E.Frankweiler, and anything by Roald Dahl. DIANA WYNNE JONES! I've been needing to read her books since watching Howl's Moving Castle but somehow haven't gotten around to it... It's always been hard for me to pinpoint favorites, but some of my favorite series from 4th-7th grade are Redwall, Circle of Magic, Lost Years of Merlin, and Dark Instruments (I think that's what it's called?). Definitely my fantasy and animal phase. I haven't read this series, and it's shameful, considering I am studying to be a youth services librarian. I loved Jones' Dalemark Quartet; I remember sobbing in the last one and how brilliant she made it all turn out. I'd say that was definitely a favorite series. My other very favorite book from childhood, and still my favorite, is A Wrinkle in Time. There's just something about the way L'Engle writes... she knows just how to turn a phrase and I still get chills when I read the line "There is such a thing as a tesseract." It's a great story that I plan on sharing with my children when I have them someday.